Goldfish for Kids: Learn about this popular fish pet. The goldfish is one of the most popular fish to keep as pets in aquariums, fish bowls, or small ponds. They are actually the most common household pet in the United States. The scientific name, or species, for the goldfish is Carassius Auratus. They come from the family and order of the carp. There are many types or breeds of goldfish. They can vary in size, color, and shape. Many are orange-gold in color, but some are grayish-white with orange spots (like the comet goldfish) and some have black spots or are olive-green. There are fancy goldfish, like the Jikin, which has a butterfly or peacock type tail. The Egg-fish goldfish has a more rounded shape, sort of like an egg. 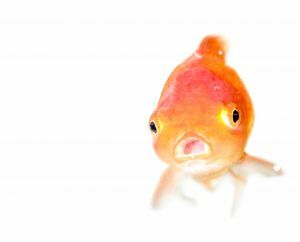 One type of goldfish, the bubble eye goldfish, has big bubbly looking eyes that bulge out from its head. Pretty cool! A well kept goldfish in the perfect environment can live for years. 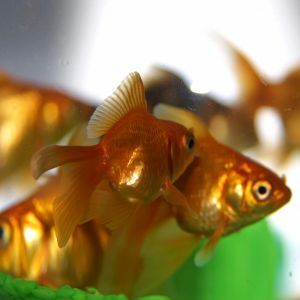 There are instances where goldfish have lived over 40 years. This type of longevity is rare, though, and many aquarium goldfish will live for 6 to 8 years when properly cared for. Goldfish are a freshwater fish and like to live in water that is 50F to 76F. Many goldfish live in aquariums and small domesticated ponds, but some do live in the wild. In the wild they live in slow moving rivers, lakes, and ponds. They like to eat plants and insects when living in the wild. When living in aquariums, they like a lot of space. At least 10 gallons of water for each fish, but the more space the better as this gives them more oxygen, which they get out of the water. Goldfish were originally from China. During the Tang Dynasty and the Song Dynasty the fish were bred for their golden colors. Later, goldfish became popular in Japan where many new breeds were introduced. They were brought to the United States in the late 1800s. Goldfish might be a bit smarter than you think. Some goldfish can see and remember well enough to distinguish between people. They often notice the person that feeds them each day and will get excited when they see them. There have been cases where goldfish have been trained to do tricks like swim through mazes, swim through hoops, or even push a ball into a net.